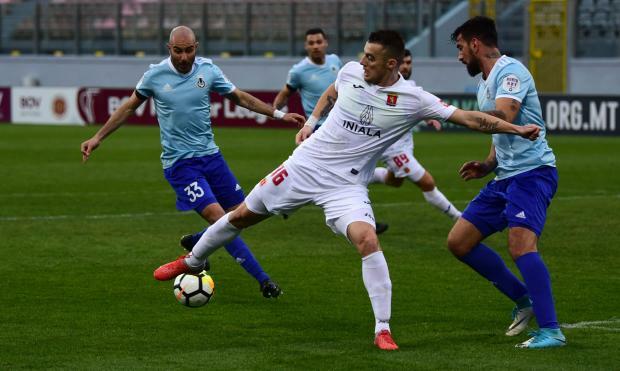 Champions Valletta were back to winning ways when they beat Sliema Wanderers at the National Stadium. As expected it was Valletta who dominated proceedings for much of the first half with Sliema trying to contain the pressure and try to break with quick forays on Jefferson and Younes Marzouk. On seven minutes, Miguel Alba picked Mario Fontanella inside the area but his shot flashed wide. Ten minutes later, Alba almost drew first blood but his curling free-kick was tipped to a corner by Sliema goalkeeper Jake Galea. Sliema threatened on 24 minutes when Mark Scerri played in Jefferson but the Brazilian was denied by the onrushing Cini. Valletta took the lead ten minutes later when from an Alba free-kick, Steve Borg’s dipping header flew into the net. Sliema tried to respond three minutes later when Marzouk picked Frank Temile who headed over. In the second half, Sliema tried to get more into the picture but it was Valletta who came close on 48 minutes when Joseph Zerafa found Bojan Kaljevic who headed wide. Seven minutes from the restart, Temile showed great agility to move past Ryan Camilleri but his angled drive rolled just wide with Cini beaten. Borg came to Valletta’s rescue on 58 minutes when he showed great awareness when he closed out the goalbound Jefferson who had been put through on goal by Mark Scerri. On 69 minutes, Sliema came close when Jefferson hit a firm drive that was pushed away by the diving Cini. Two minutes later Valletta were unlucky not to put the match beyond the Wanderers when Fontanella did well to exchange the ball with Kaljevic but his shot came off the upright before the Blues cleared. Valletta sealed their win with the last kick of the match when in a quick break, Kyrian Nwoko played in Matteo Piciollo who blasted the ball into the net. Miguel Alba of Valletta was named BOV Player of the match.